Not quite a correction yet - will we get there soon? Markets were determined to drop this week and drop they did. After a big rally on Thursday based on a better than expected GDP number, stocks got right back to the business of moving steadily downward. The S&P 500 ended the week off 4%, the NASDAQ was down 5.1% and the Russell 2000 plunged 6.3%. The Dow was the top performer with a loss of only 2.6%. Is this a correction yet? The Russell 2000 is down 9% from its closing high only two weeks ago so you could say small caps are pretty darn close. Other major averages are not in such bad shape yet but are getting there. The S&P is now down 5.5% from its recent high. The NASDAQ Composite is right in the middle. So with some relief we can say that this is still just a pullback. But there is little comfort in that statement as some the following charts will show. This first chart tracks our moving average analysis. The count of stocks above their 50-DMA (the yellow line) , has really plunged. Only about 35% of the roughly 7200 stocks and ETFs that we evaluate each weekend are still above their 50-DMA. Extending the signs the of the downturn, the magenta line which tracks the number of stocks whose 20-DMA is above their 50-DMA has also definitively rolled over. Stocks have fallen so fast the magenta line hasn't had time to come anywhere near catching up with the yellow line. This chart is finally showing the cross-over of the red and yellow lines. This means the number of stocks in strong down-trends is now higher than the number of stocks in strong up-trends. This is the sign of a real pullback, not just a few days of sagging stock prices. 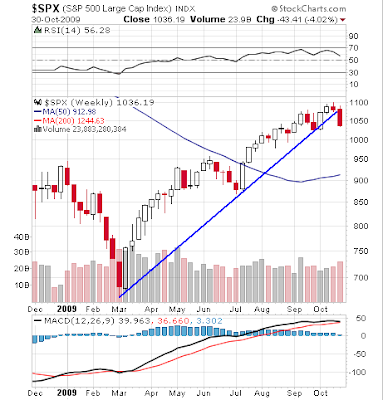 As perspective on where we are today, the following is the weekly chart of the S&P 500. Note that the bullish trendline starting at the March low was violated to the downside this week. In terms of the daily chart, SPX has broken below it's 50-DMA and is now positioned right at its lower Bollinger Band. And we're coming up fast on support levels at 1030 and 1010. Down from there, next stop could be as low as 950. Our statistics show a serious downturn underway. In last week's post I said that bearish setups were developing on the charts of our statistics. They have certainly come to fruition this week. Optimistically speaking, however, it looks like the charts are approaching levels where turn-arounds usually occur. As internals deteriorate, stocks get to a point where things can't get much worse. We're probably not quite there yet, but in a few days investors will probably stop and ask themselves what is different today, in terms of stock fundamentals and the economic situation. What reasons are there for lower stock prices? Earnings season is nearly over. Investors were disappointed that so many companies relied on cost cutting and failed to report improved revenues. Yet, many companies did provide positive outlooks that imply revenue growth is imminent. On the other hand, the jobs picture remains disappointing and improvement seems to be coming painfully slowly. This should be no surprise as most economists and analysts have said that unemployment will hit 10%. We're not there yet. Then there is the real estate market. Some improvement was seen during the peak buying months of the summer, aided by the first time buyers credit. As the buying season wanes, investors should expect home sales to sag. So things aren't getting noticeably worse and a significant number of companies are projecting that things will get better. Emerging markets seem to be recovering quicker than Europe and the U.S. and that should provide some support to manufacturers. So, stocks are down and still weak while the economic outlook is weak but slowly improving. Not exactly a recipe for soaring markets but is it really a recipe for anything worse than a correction?